'Albro House', the Robert Lewis Burton estate designed by Charles W. Romeyn c. 1899 in Lawrence. Burton was partner in Burton Brothers, cotton manufacturers. He also developed portions of Woodmere. 'Albro House' was demolished c. 1945. Click HERE to see where it stood on bing. Update: Below is a loose photo I've had that I only now realize is the R.L. Burton residence. The SPLIA and Spinzia books credit Joseph Taft with the design though the photo lists Charles Romeyn as architect. I unfortunately don't have a date on the photograph. Any thoughts? 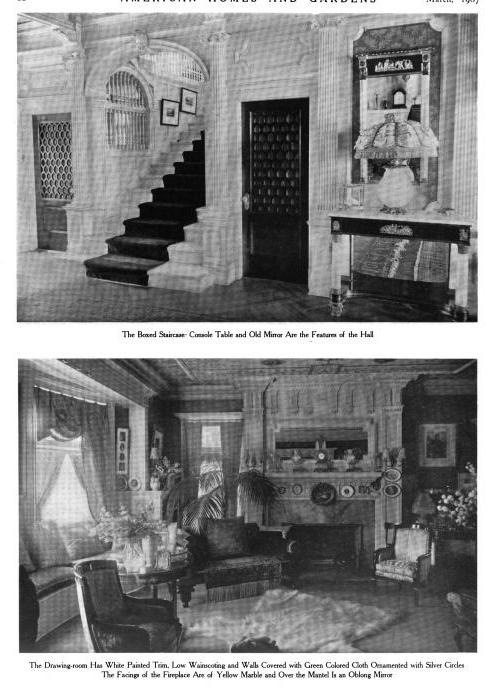 Photos from American Homes and Gardens, 1907. Albro Lane - The Albro Farm appears on the 1891 Wolverton map between the Rockaway Hunting Club and Woodsburgh. George Albro listed his profession as "Oysterman" in the 1880 census. His son Eugene is listed as an ice man on the 1900 census. Burton Avenue - Robert L. Burton made his fortune in textiles. In 1901, he purchased the entire village of Woodsburgh from the estate of Samuel Wood and began the development of his planned community of Woodmere. He and his brother, John Howes Burton, were both members of the Rockaway Hunting Club and lived in Cedarhurst (later Lawrence). BTW, the July 1918 Summer SR puts John Howes Burton and his wife Marie D. Brooks at Albro House. Robert and his wife Florence Southwick are at Crawford Farms in Milbrook. The same holds true in the Summer 1920 SR. Photos of Burton's Woodmere development tomorrow. 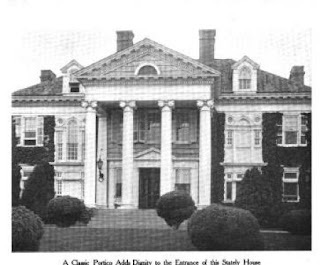 Crawford Farms in Millbrook is where Burton eventually died in 1927. The garden may have been delightful on a sunny day. 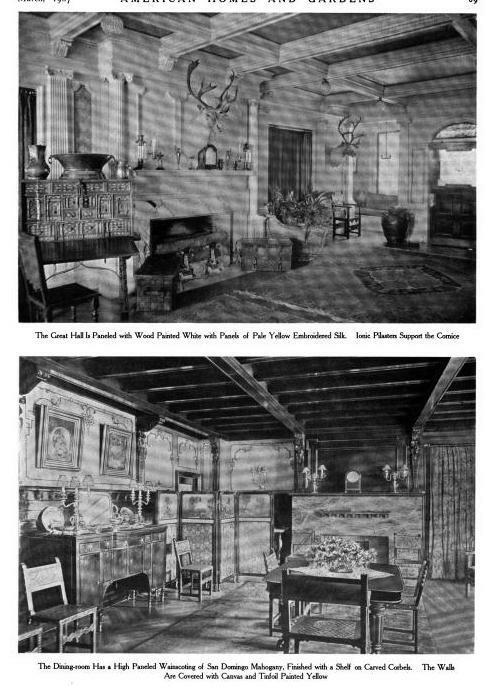 But hanging caribou heads on walls of "pale yellow embroidered silk," or covering the upper walls of ones dining room with "canvas and tinfoil painted yellow" are clearly crimes against nature. "Den...in the Style of the German Renaissance...Crowded with interesting Bric-a-brac....."
You gentlemen take shots re the variety of windows, I'll be in the den with a case of cabernet. Once again the CPH dringing game falls flat. I do like the main body of the house and the large scale windows flanking the portico only add to its appeal IMO. Since drinking game's recent inception, there have been a number of homes featured, Martin Hall, Lauderdale, Northcourt, Castlegould where the number and variety of windows approaches double digits, but no mention was made of their architects. Oh well, tough to please a crowd that wants to see endless monotonous rows of Charles Platt Neo-Georgians on every street. That being said, Ancient's additional facts and miscellaneous trivia are astounding as usual. I would swear he attended every home's house warming party. A very interesting ecletic interior to say the least and I would love to know what the Den ceiling looked liked in its entirety. A collector's house for sure. 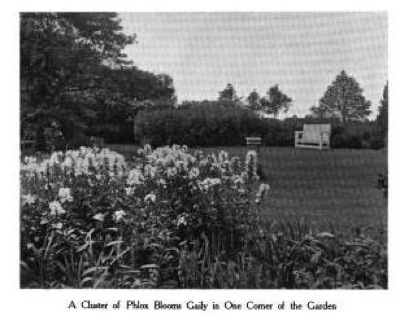 Also on one of Ancients links to the five towns area, there is a nice real estate brochure you can download of the planned community of Woodmere. The following link should open up a pdf of the brochure. Good catch on the random photo, Zach. Obvious from the landscaping that the random photo is an earlier picture of ‘Albro House;’ plus in the random photo the porch on the right is open & in the multiple photos you can see it’s been enclosed; which leads me to speculate “Albro House’ was remodeled & that is why two different architects are cited (ta-da). Possibly the enclosed sun room on the back of the house was added as part of the remodel? But I agree with Ancient that the interiors would look better stripped bare, except the beamed ceilings, & redone with a “less-is-more” attitude; because I suspect the bones were good. 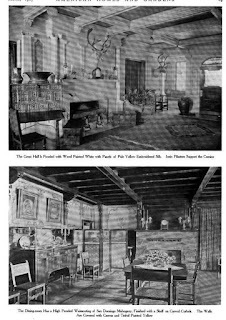 & if I’m correct & that is what the interiors looked like after remodeling then a certain decorator should have been forced to dust those rooms daily for as long as the house stood. Stray comment, maybe helpful in dating this house: I note the John H. Ballantine estate is right next door to the East. "A collector's house for sure." Try that out on Richard Jenrette and get back to us. SEC WORD: 6 gingcopm -- As in, "The evening began inauspiciously, as he stepped on 6 gingcopm on his way to her door." Despite the opinions of how it would rate with current tastes, I think it is a very good Colonial Revival house of 1900, high style for what it set out to be. Looking at this on my iPhone, the shingles were a pleasant surprise, reinforcing my previous comment. Another interesting feature is the two tone exterior scheme; the windows, frieze, and columns are light (white? ), but the shingles, eaves and pediment are darker (gray or yellow?). Can you -- or anyone else here -- make out the frieze on the early iteration of the house (the last picture shown)? That obviously crossed my mind but what I find weird is both Taft and Romeyn have their own sections in the SPLIA book...so why the confusion? Certainly not beyond reason that Burton would have alterations done within five years of the completion of the house though it is kind of odd he would have gone with a different architect so soon....an architect that would later get all the credit for the house (when it seems all he may have done was enclose a porch). "Try that out on Richard Jenrette and get back to us". Mr. Jenrette is a God. Always love a preservationist who has the means to start his own personal collection of houses not just a few rugs or shelf of candle holders. In the last picture, the frieze appears to be the same color as the shingles. But the pediment matches the columns. At some point, there seems to be an intent to balance tonal colors to compliment the vine-covered walls. 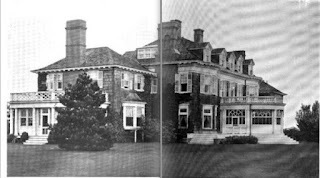 There are mentions (with no photos) in both the 1893 and 1896 Yearbook of the Architectural League of NY for Romeyn & Stever commissions in Cedarhurst so the house is likely older than originally believed. I checked the 1887 SR for either Burton. No luck. Obviously it would be helpful to know just when they acquired the property. Sigh. I point out once again that Gilbert is not singled out for special brickbats---its just that he's the only designer of second string houses who gets claim of first string design quality. He simply wasn't as good as many other big boys. In fact, I like this house---the window placement is a lost less gratuitous and out of scale than with many classical houses by certain 'other' designers. This house has a certain 'prettiness' to it, along with the contrast of detail and shingles, that I like. As to the interiors, I'll be in the library with Flo and her cabernet. When I blow up the pictures of the two iterations of today's house, the windows on the first and second story of the central section look different -- the outside ones on the first floor, the inside ones on the second. And while I take TDC's point about the paint, the frieze looks different, too -- as if there's space between it and the upper windows in the early front. Certainly more interesting than the entrance facade of "Fairleigh" and maybe even better looking than "Templeton" (1). I agree much better looking than the I.U. Willets "Templeton", but I wouldn't say better than the "White Eagle" "Templeton". In the Galleries of the American Fine Arts Society, 215 West 57th St., From Saturday, Feb. 11th, to Saturday, March 4th, Inclusive. 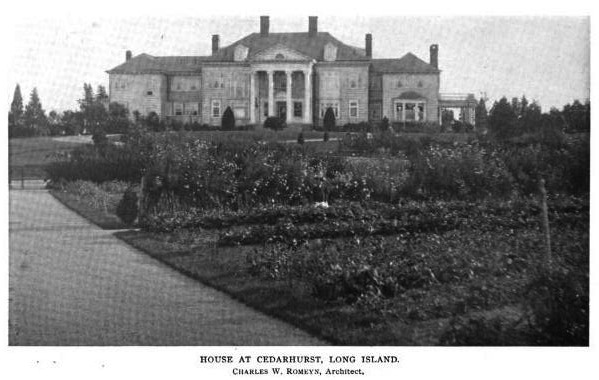 877 HOUSE AT CEDARHURST, LONG ISLAND. Charles W. Romeyn. R.L. Adams, Draughtsman. The picture you posted above appears perhaps halfway through the illustrations. The pages aren't numbered, and the photo is not particularly clear -- though a little different from above in that slightly different areas are obscured in the print. I've changed the name of the architect to Romeyn in the post. I assume Taft was responsible for the alterations a few years later...though I'm not entirely sure how he wound up getting credit for the house. The porch was enclosed to create an office for Burton. 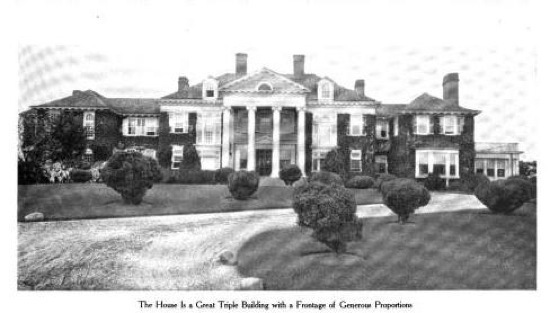 Here's a 1902 mention crediting Joseph H. Taft with the Burton residence. 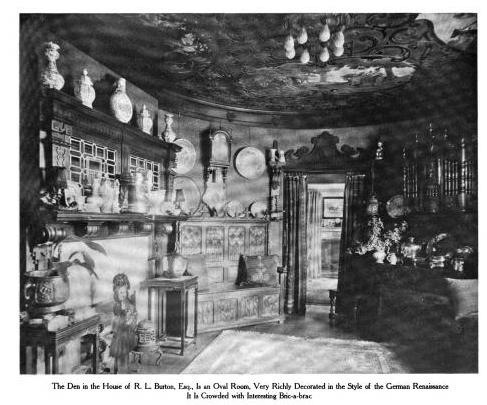 I suppose a decent guess would be that the house was designed by Romeyn for someone else c. 1899 and purchased by Burton likely in 1901, the same year he purchased the land for his development. He then enlisted Taft in 1902 to design alterations to his tastes including enclosing the porch for use as his office. 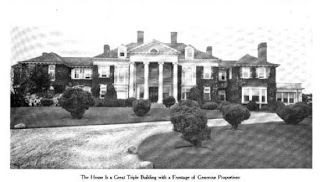 Here's a guess as to why Joseph H. Taft was eventually given sole credit for designing 'Albro House' when it appears Charles Romeyn was the architect of the original house -- because R. L. Burton wanted Taft to get credit since Taft was helping Burton design the planned community of Woodmere ... so why not tell everyone Taft also designed the developer's house? It makes sense to me ... in my experience developers are like Realtors in that they'll say whatever best promotes their product (think Stanford White). BTW, is that a scarecrow in the foreground of the 1899 random picture? I wasn't even thinking of the I.U. Willits Templeton (2) - ha ha. Only saying that I like this entrance facade with the four columns better than the White Eagle/ Templeton (1) entrance (south) facade with four columns. No comparison whatsoever with the superb East facade on Templeton 2. Albro House is really a interesting subject and useful commments by The Ancient has been really helpful to go in detail.